Home / News / How to Rework Your Internal Organization Using the Lego® Serious Play® Method? How to Rework Your Internal Organization Using the Lego® Serious Play® Method? 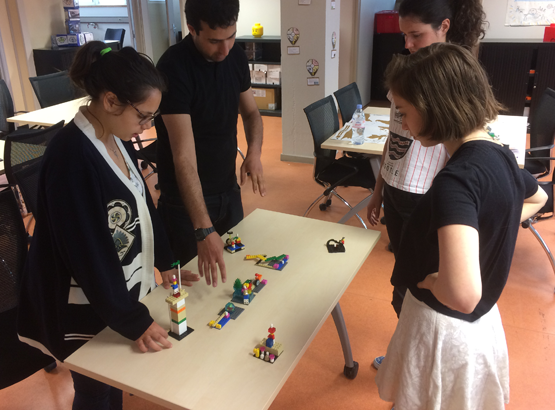 Fourteen employees at the Isère Media Library took part in a Lego® Serious Play® workshop that was delivered by three accredited coaches from Grenoble Ecole de Management. The goal was to rethink operating processes in order to improve the efficiency of this public service. Invented 15 years ago by Lego®, the Lego® Serious Play® Method has invaded France thanks to two professors and trainers, Jean Semo and Marie Dupont. Three GEM employees ( Isabelle Patroix, Anne-Cécile Hirlemann et Alexia Audemar) completed the 40 hour coach training program. As GEM playground manager, Isabelle Patroix is in charge of promoting the school’s serious game activities such as the workshop implemented for the Isère Media Library. Overtime, employee missions at the Media Library have slowly transformed. Mobile “bus” libraries have disappeared while new missions have been developed to manage film content, video games and other recent types of media. However, despite these evolutions, the 14 employees still share the same fundamental goal: to facilitate the general public’s access to content. The goal of the workshop was to rethink this transformation by understanding the library’s current processes and exploring other possibilities for collaboration. The team came together last december for a day of group work on the subject of reorganizing each person’s mission. To facilitate this task, the GEM coaches helped participants build a fun and interesting program to implement change. What is a media library? What are its missions? How do various actors interact? The first step for the media library's employees was to take part in a shared experience thanks to the discovery of a new learning tool. "The first collaborative building activity with Legos® helps create a realistic view of your group and the interactions that exist between various members of the team. The method encourages participants to speak with their hands instead of their intellect. The variety of possible constructions opens the door to metaphors and turns ideas into concrete questions about key values. The activities enable them to say so much more through what they're building. For example, one of the first exercises is to build the 'your ideal tower'. For some participants this means a symmetrical and spacious foundation, for others its a very tall tower and yet again, for others its all about building a solid foundation," explains Isabelle. After discovering the method and defining their roles, the next step for participants is to create a professional identity. The idea is to illustrate connections between one's missions and the missions of other employees by identifying shared interactions both internally and externally. "The Lego® Serious Play® Method enables participants to consider possible changes in concrete terms: a person is absent, a service disappears, etc. By moving Legos®, participants can visualize how various elements impact each of their professional identities." The goal is to raise awareness and facilitate a shared vision. Isabelle concludes: "The Media Library's first work session was designed to open the door to new ideas. The entire program will lead to the creation of new job profiles and services that will be better suited to match the needs of the current library and its users."